The Rev. Father Sud Tiwari, our Priest-In-Charge, was ordained in the Anglican Catholic Church of India. 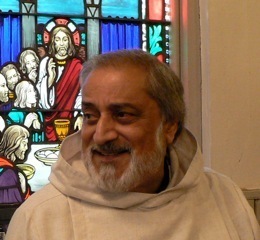 He holds undergraduate and graduate degrees in Divinity, Economics, Psychology and Finance from the Church of North India Divinity School, University of Bombay in India and from Adelphi University Graduate School of Business, Long Island University and Mercer School of Theology in the U.S.
Father Sud worked in the secular field and left his last position as Sr. Economist at PepsiCo Inc. to pursue a career in Hospital Chaplaincy. He is a canonically resident priest in the Episcopal Church in the Diocese of Central Pennsylvania. Father Sud prefers preaching short sermons, often using stories from the East and applying the metaphors in our daily life. He is married to Stefania Tomichek Tiwari for over 45 years and has two married daughters, Simone Tiwari Heisey and Suneeta Tiwari Cound and three grandchildren Solomon, Derek and Gabriel.